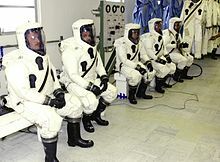 US Air Force firefighters in suits with an outer aluminized shell go through a decontamination line during an emergency management exercise. DEA agents wearing Level B hazmat suits. 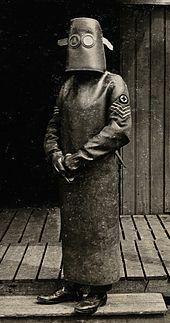 A radiographer wearing a hazmat suit during World War I, France, 1918. NASA technicians in SCAPE suits prepare to fuel a spacecraft. This page was last edited on 31 January 2019, at 23:27 (UTC).